I said I would try not to ask dumb questions as a new kid, but I've never seen this discussed. After searching and finding nothing, I decided to make a topic and hope an older one didn't slip by me. Have tayuu geimyo and their creation ever been discussed? They seem to have quite different names compared to geisha. I can't really answer your questions adequately, but you can find good information about tayuu/oiran naming in some of the better books about the pleasure quarters such as The Nightless City by J.E. De Becker and Yoshiwara: the Glittering World of the Japanese Courtesan by Cecilia Segawa Seigle. I haven't read either of these books in about two years, so I can't say much. 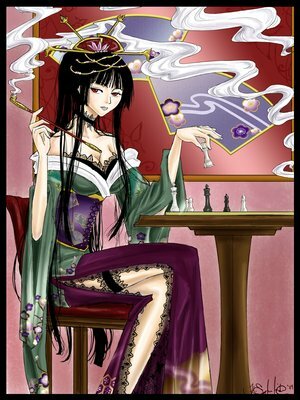 If I remember correctly, a courtesan would take a different name at different stages in her career. She would get a new name when she became a kamuro (something short and cute). As later period oiran might have two kamuro, the practice if I remember correctly was for the two kamuro to have names that complimented one another. When she officially became a courtesan, she got another name. I don't know if a courtesan's name would be taken from another courtesan the way it is with geiko, but I think it was common for them to have a name just created for them. If a courtesan then became an Oiran she inherited one of the famous names. Certain bordellos had the rights to certain Oiran names. The Corner Tamaya owned the Komurasaki name/line, if I remember correctly. As for the style of tayuu/oiran names differing from geisha's, well the most famous tayuu names originated at least a century before geisha even existed and then didn't change, so stylistically they're much older and sound older. Geisha have continued to update their names over time, with certain sounds like -chiyo, -yakko-, -kichi, and -yae not showing up nearly as much as they used to. It's natural that they sound different. Thank you. I wasn't sure if there was any information to be had in regard to tayuu names since info is scarce to begin with. Do you think their names would have sounded fanciful (as they do compared to modern names) when they first appeared or would they have fit in with the times? Is there any kind of list of known tayuu names? I kind of like them. If I remember correctly, both books I mentioned have lists of the most well known tayuu/oiran names. Some of the ones I can remember off the top of my head are Takao, Komurasaki, Hanamurasaki, Hanamado, and Usugumo. Those names really would have been rather extravagent compared to normal female names of the time. I didn´t understand this "sound older" part.What would be the these sounds? Even when she wears the obi in the "normal way" she is with a very flamboyant indumentary,something that resemble tayuus a lot. Maru (マル?) and Moro (モロ? ), whose respective real names are Marudashi (マルダシ?) and Morodashi (モロダシ? ), are two artificial beings that keep Yūko's shop in existence. They are two energetic small girls, who often speak in unison and repeat the words of others. They cannot leave the shop, as they have no souls. They help Yūko around the shop most of the time, but often go into long periods of hibernation due to the strain from keeping the shop in existence. Yuko uses the last bit of her power to revive Maru and Moro and send them back to the shop. After Watanuki becomes the new shop's owner, Maru and Moro become his assistants. 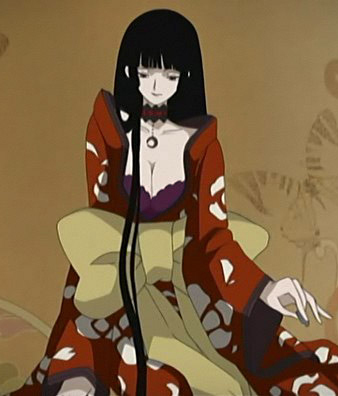 Later it is shown that they have developed a very close bond with Watanuki similar to the one they had with Yūko. Maru is voiced by Kazuko Kojima in Japanese and Leah Clark in English. Moro is voiced by Hisayo Mochizuki in Japanese and Brina Palencia in English. Courtesans' names sound like nothing else in Japan. They took the names of romantic heroines or poets, named themselves after places of natural beauty, or used poetic images like "Evening Mist" or "Wind in the Pines." A new tidbit... Many courtesans' names came from the names of court ladies. Aristocrats of the time (1500's, I think) didn't use their personal names in public; it was too intimate, too presumptuous. Instead they took on other names for public use. Court ladies often adopted names from the Tale of Genji--not just characters' names and epithets, but the names of chapters, etc. These names were called genjina, literally "Genji names." Then courtesans heard about this and began adopting genjina for themselves. Court ladies quietly stopped using genjina. Soon, "genjina" became almost synonymous with "courtesans' or prostitute's professional name." Of the five tayuu names Fuyou listed--Takao, Komurasaki, Hanamurasaki, Hanamado, and Usugumo--three are Genji names. Komurasaki (Little Purple) and Hanamurasaki (Purple Flower) are references to Lady Murasaki, and Usugumo (Faint Clouds) is a chapter title. By the way, prostitutes at all levels used all these names. (Except for Takao--possibly.) No brothel had sole right to any name. What they did have was a "lineage" of top-ranking women with the same name, sort of a seal of quality. Any ditchside harlot could call herself Usugumo, but to be Usugumo of the Tamaya, well, that was something.